Looking for high-quality A-frame (sandwich board) signs? Look no further than Evan Evans. We can provide you with the perfect A-frame signage to gain more exposure for your business. A versatile and portable solution, this signage is perfect for the sidewalk to draw attention to your shopfront. Sandwich board signs also offer simple pack up and moving options and are the ideal accompaniment to real estate or open flags. 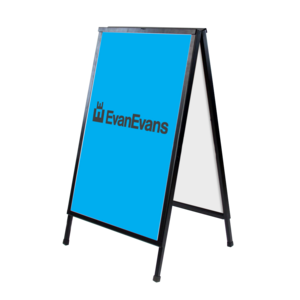 When you need A-frame signs in Melbourne, Sydney, Brisbane, Adelaide, Perth, or elsewhere in Australia, contact the team at Evan Evans. We’ll work closely with you to obtain the high-quality results you desire. A-frame signs are a great way to make the most of the daily foot traffic that passes by your business. Designed to be eye-catching and draw the attention of the public, A-frame signs can be the difference between a pedestrian walking by your business or stopping to check out your store and see what you have to offer. When you visit Australia’s major cities, you’ll notice many of these versatile signs around, with A-frame signs in Melbourne’s CBD, all over Sydney, and even in the west coast city of Perth. This is due to the fact that A-frame signs are a cost-effective option, as well as being easy to set up and a breeze to move around and reposition. For custom A-frames that are specially designed to meet the needs of your business and advertise any specials you’re offering, please contact us today by calling 1800 990 989. One of our friendly staff will be happy to help you.